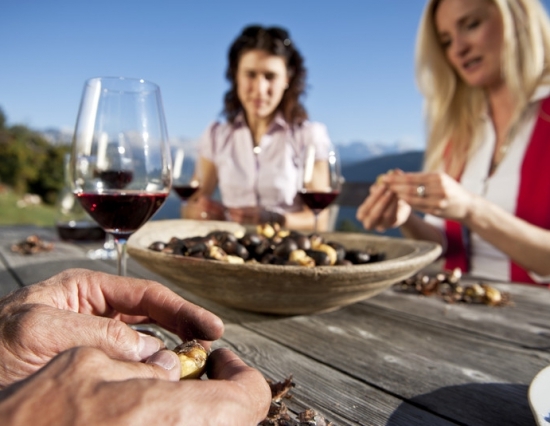 Enjoy wonderful autumn hikes and culinary delights around "South Tyrol's favourite custom" - the Törggelen. Roasted chestnuts, young wine, hearty dishes and a cosy get-together await you. Including a bottle of red wine from the house on an evening of your choice and the BusCard Meran. BusCard. With this card you have the possibility to use all the buses in the area of Merano and surroundings. BusCard Merano: The BusCard Merano and surroundings is the right choice for all those who want to explore the Merano countryside by bus. The card allows you to use all bus connections in the Merano region. The BusCard Merano and surroundings is valid for 7 days from the first validation and is available at the tourist offices in Merano and surroundings.